A mammogram is a low-dose x-ray of the breast; Mammograms are performed for two major reasons. First, in women with breast symptoms, to detect a possible cause for their symptoms (a diagnostic mammogram), and secondly, to detect early signs of breast cancer in women who do not have breast symptoms (a screening mammogram). The x-ray dose from a mammogram is very low. It has not been proven to cause any harmful effects. 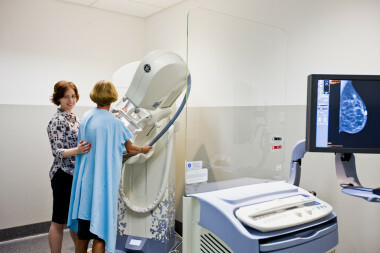 The mammogram is performed by a specially trained, experienced female radiographer. You will be required to undress to the waist and will be given a loose-fitting gown to wear. Each breast will be positioned between two flat plates and compressed. The compression will be firm and may be uncomfortable, however, it should only last a few seconds whilst the x-ray is being taken. The compression helps make the breast a uniform thickness, which makes the image clearer and minimises the x-ray dose to the breast tissue. Initially two images will be taken of each breast but further images may be required. The mammogram appointment time is usually 15 minutes. More time may be needed if you have breast implants. The images will be reviewed and reported by at least one radiologist. Typically, the results will be sent directly to your doctor. When making your appointment, please let us know if you have breast implants as we will need to make sure you have a longer appointment time. If your breasts are tender just before your period, it may be more comfortable for you to make an appointment just after your period. The risk of breast cancer increases with age, especially after the age of 50 years. It is suggested that women over the age of 40 years, without breast symptoms, have a screening mammogram every two years. There is no proven benefit for women under 40 years to have routine screening mammograms. Annual screening mammograms are only suggested if you have had a previous breast cancer or have a very strong family history of breast cancer (ie multiple affected family members). Your doctor can tell you if you are in the latter group. If you have breast symptoms your doctor will indicate whether you should have a mammogram. Please make sure you bring all previous mammograms and breast ultrasound scans with you to your appointment.